This collection of selected documents from the ANRI archives published as articles will expand over the years. This may be done with the help of specialists, students and university teachers. This overview shows all the articles present in the Harta Karun. The first articles were published in 2013 and the list is steadily growing. The article most recently released is shown first in the following list. You can select a column to re-order the articles. The articles are downloadable in both the English and Indonesian languages. All selected documents are categorized into four main categories and twenty-four sub categories. The documents from 2013 were mainly selected from the late seventeenth century. Some sub categories expand quicker than others depending on the interests and contributions of scholarly collaborators. 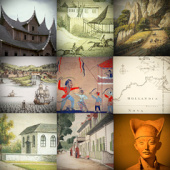 The first articles were selected and created by an expert team of international historians, archivists and translators. Several international professors and senior lecturers wrote short introductions. But the further collection is also open to other individuals, or groups. When students, beginning researchers or others find an interesting document in the scanned series online or during their research in the ANRI-archives, they may propose this document for publication and the Harta Karun team may help to correct the transcription, help to translate and publish. As the collection is not only open for the contributions of individuals, a group of students may also want to contribute a number of articles for a specific sub category or theme. Such an inititiative should be closely supervised by a university teacher. For further information please contact the Editor-in-Chief (see Organization -> Contact).